A spectacular place lost to pillage and imperialism. Thousands of quetzales appear to have been stolen from the intake from Quirigua, Kaminaljuyú, Iximché, and Zaculeu. “People without identity, history, and memory are doomed to failure” said a group pushing for preservation. The value of the crowns stolen from the Virgin of the Assumption is spiritual, not financial. It is unclear exactly what was stolen or how much it is worth. Reporting on an internal conference on the repatriation of Native cultural options. According to the suit the former owner of The Actor sold the piece in 1938 Italy under duress to Paris art dealers Hugo Perls and Paul Rosenberg. The Met denies the sale was made under duress. The suspect in the Gardner Heist “has repeatedly denied knowing the whereabouts of any of the art taken”. Upon the death of dealer Daniel Wildenstein, his heirs are charged with tax fraud regarding money and painting held in trusts. The piece was purchased by art dealer Hildebrand Gurlitt in 1939 from a woman who fled Nazi Germany because she had a Jewish husband. An article quoting only critics of Kulturgutschutzgesetz which nearly every expert who seeks to stop the illicit trafficking of antiquities really likes. The former chair of the Communist Party of Britain is among the artwork heirs to benefit from this Nazi-era restitution. There is a new board for the International Association for the Reunification of the Parthenon Marbles. The pieces were stolen from the Van Gogh museum in Amsterdam in 2002 and though there were convictions, the art was only found now. Ex FBI agent Robert Wittman talks about why the Van Goghs recovered in Italy were not so easily fenced. The pieces ‘surfaced’ in a Venice gallery in 1995. The piece was taken from the cathedral of Pirineo in 1979. The police say the theft had not been reported by the building’s managers for 16 years. Four people were arrested and two houses were searched in Burgos leading to the seizure of stolen sacred art. Nearly 200 pieces were recovered, some of which were damaged in an attempt to hide their origins. “Police and heritage experts joined together in a coordinated enforcement operation” to halt metal theft from historic churches. 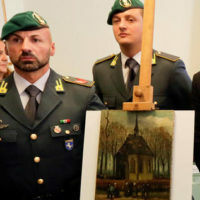 Sotheby’s has had to take back a fake Hals and the suspicious Cranach owned by the Prince of Liechtenstein is mentioned with intimations that they are by the same forger. The money is meant to come from Kapoor but, of course, they are unlikely to see any of it. The article notes that it took 2 years to negotiate the return of the last idol from the National Gallery of Australia so these might take a while. The returned piece will go back to the World Heritage Site in Gujarat that it was taken from. The man who stole the Maori carvings has been convicted but not all of the pieces have been recovered. The gang specifically targeted temples with poor security and without CCTV. The piece was stolen from Gujarat in 2001 and was located in London in 2015. Gold ornaments of the deity were stolen from Sri Annapurneshwari Temple, Kabbinale village, Udupi district. Idols of Ram, Lakshaman, Sita, and Hanuman were taken and the theft was detected when a caretaker noticed a broken lock. A must read concerning high level corruption and wildlife trafficking. The new law required all autographed material to be accompanied by a certificate of authenticity.